Our unique signature program guides high school students through Microsoft Certifications in Microsoft Office Suite, Web Applications, Mobile Applications, Network, Security, Server, and more. Teen Tech graduates have essential entry-level technology skills. Do you live in Hillsborough County, Florida? Can you commit to a minimum of two hours each week? If you answered yes to all three, be sure to fill out the form so we can contact you regarding an orientation date! Check our calendar to see which classes are near you. 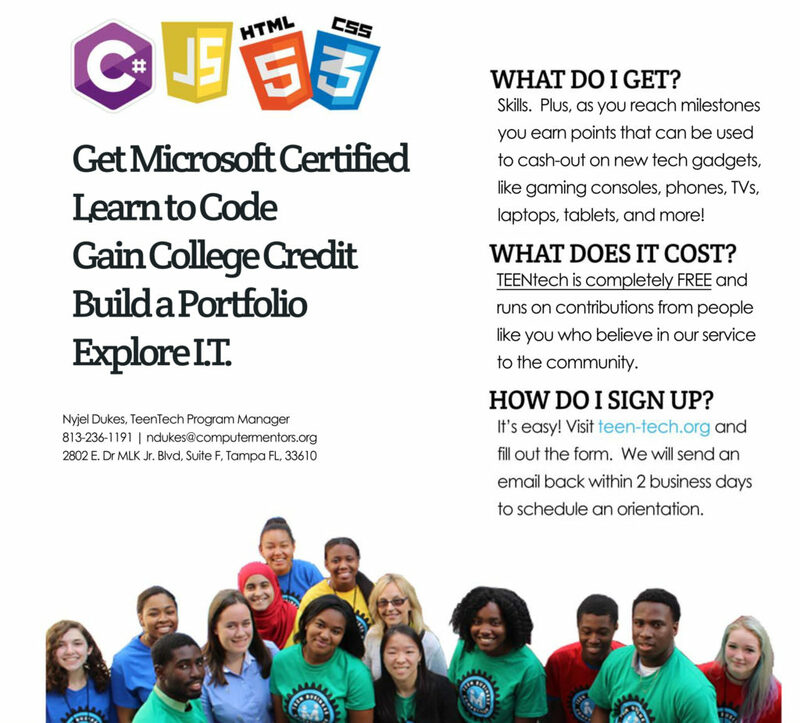 Teen Tech is a free program currently offered to Hillsborough County students, between the ages of 14 and 18. Students attend Computer Mentors one night per week for two hours and engage in technology training and mentoring in a self-paced environment. Some students may stay for six months, while others remain with us all four years of High School to get the most out of the program. Students’ development is supported with proven curriculum and experienced mentors passionate about technology and community empowerment. The more the students accomplish, the more experience and points they earn. Points can be used for tech tools and toys (including gaming systems, laptops, tablets, and phones.) The experience can be used for life. Teen Tech is self-paced and open-enrollment. Students may start as soon as their first orientation date! I’m an I.T. professional. How can I get involved? There are several ways you can help – the best way is to Volunteer with us! Interested? Leave your information below and we will reach you via email within 1-2 business days. Monday, Tuesday, Wednesday, or Thursday, 6 to 8 p.m. all year around Hillsborough County Check our calendar for location dates and times.